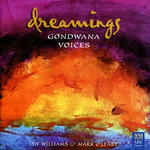 Dreamings / Gondwana Voices ; Lyn Williams & Mark O'Leary, conductors. The unicorn : for two-part treble choir, piano and strings / words and music by Dan Walker. The unicorn : for treble voices and piano / Dan Walker. This simple work is about a dreamer walking through a forest and chancing upon a pair of unicorn. The melody is flowing and legato, with ever widening intervals as the dreamer is amazed at the beauty of these magical creatures. This piece would suit a good primary or lower secondary school choir. Instrumentation: Children's choir, piano, 2 violins, viola, cello, double bass. Commission note: Commissioned by Sydney Children's Choir.